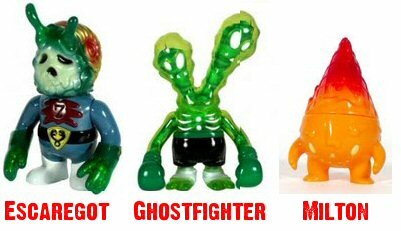 While there is a lot of certainty that the new reveal will be at the Super 7 store in Florida, the new clue is Escaregot, Ghostfighter, & Milton, which are all characters sold by the Super 7 store. Thanks to MiddayShadows for being the first to tell us about the new clue, and AndySchex for telling us about the figures. New to the lostargs, though I have been following for awhile. Just received my Transmission poster yesterday and I couldn't be happier. BAM! Super7, here we come! I wonder if they haven't decided weather it'll be the Tampa or San Fran store yet to see how many a chattering about showing up? @Zort - sounds like a worthwhile and fun trip you're having. Thanks for putting together the list, LT! This new feature sure makes it easy to follow everyone for each reveal! Worked pretty well . yes? Any holes in one Rev Milo? Booneboy, nice catch on the # of letters vs reveal date/time (from comments in previous post)! Friday 11/6 at 9AM Pacific Time would fit the pattern of reveals so far. Oh lord, if it's 9AM I will be running late for work! (Though with them selling out in .0001 seconds I guess not that late). In some ways I can't wait for this ARG to be over, I get SO stressed out waiting for reveals. Haha. Just sent you one, too, DM. Is the San Fran store open at 9am? The one in St. Pete opens at 11am. KharmaInitiative - thanks for the prompt, I missed that the first time I looked through the comments. I've added it to the main page now. Dragon Management - i've also sent you a request to follow you. Thanks! Dragon Management, you are going to have a lot of requests in the next few days ! great job on the clue hunt, everyone! Hey all, I just want to say that the artwork posted on that last thread was really neat, and very inspiring! You all are so creative. Right, night all got to go to sleep as I'm driving back home tomorrow. I have also sent the request to you Dragonmgmt! Thanks in advance for doin' this! Thanks Obfusc8 - had totally forgotten! "Don't be frightened, we mean you no harm..."
DM, thanks for adding me to your twitter list. Maybe a hole in the head!,,Did I see $65 for one of these " Limited Edition" toys.??!!??!!?? I don't think the kiddies will be allowed to play with one of these " toys". See..there is something waiting for each and every one of you,,us..hey you every body. Its coming whether you like it or not. How you deal with it is your own,,but if you are so fortunate to keep living, its one of those rewards.. What is it that sits in your path just waiting for you to get there? Its the moment of realizing that there are things in life,,you can no longer relate to. A molded form gob of plastic goo going for 65 bucks....OH! its a Limited Edition! Toys? Limited Edition.? I thought it was against the Law to take advantage of the under aged. PT Barnum was Right.. There IS someone born every other minute to take advantage of 'em!.. I mean what is this? The Beanie Babie phenom all over again?Its more about the parents than the kids? Yes Junior, that 2 headed plastic green monster is your college fund and thats why you can't play with it..??!! Am I crazy or do these toys look kinda like the tagging done for "The Hatch"? Cap..the original " Prisoner" on AMC?..Patrick McGoohan et al? I will head to the reveal in St Pete if it is Thurs or Fri. You can follow me on Twitter @james_frazier if I go I will need someone to purchase the poster for me. ;-) poster buddy anyone? Uhhh Ghostfighter has 12 letters...not 11. So that is 9, 12, 6. I am hoping for 9AM PST! Cap..OH I see.. a whole new edition of " The Prisoner" starting Nov 15 8/7c....Oh my..i remember the original with P McGoohan..First time I saw it..rite over my head..Never seen anything like that on TV before, except some Twilite Zone and the " Outer Limits"
But..Canadian Broadcast go hold of it,,and added a few minutes commentary at the end of each episode,,and THEN..american PBS got hold of it and rebroadcast the Canadian version. The years in betwen gave me the ability to comprehend what went over my head the first time. For ALL LOST FANS..The Prisoner,, the original with or without the Canadian commentary.. is Required Viewing. The Prisoner is the Grand Daddy of LOST. Pay your respects to it. The NEW Prisoner looks very interesting. With a ad banner of " You Only Think You Are Free"..sounds like they are at least trying to stay in line with the original. The original aired 67/68..to this day there are websites dedicated to it. Thats how good it was. I suspect ..Lost will easily match that. @dragonmgmt - I sent request as well. Thanks! Just got back from watching V...right Mel, a totally new one with Jim Caviezal(sp? ), and Gandalf (Ian McKellan is it?). And it looks as if they still have the giant security balloon on the previews! X-D Yes, the original is totally out there. I've been watching a bit of it this week, and I can't believe that I understood it way back when, before I had grown my "Lost Brain", to understand the un-understandable. Trial Attorneys - In the hopes you have a poster buddy, I am following you too. Thanks. Agree on the original Prisoner. I watched the full series on DVD over a few weeks last year. At its best it is brilliant. ..Back in its day,, there was much stink raised about the quality of TV. Marshall Mcleuhan ( spelling)..made headlines with his testimony before Congress.." TV is a vast wasteland"..so,,CBS imported McGoohans solo project " The Prisoner" in what some say,,was an effort to show that " heavy" TV Shows probably wouldn't work in America. Not everyone said that,, just some. But the show ran for 15 episodes,,that is all folks,,and did gain a cult following...that is still alive today. All in metaphor, analogy, the Individual,,the Individual vs Society,,freedoms, liberties, self awareness,,etc etc..at its roots, the Surreal question,, the question plaguing mankind since he came out of the trees,," Who Am I?" Jo (of JoPinionated) will do SF if the reveal is there, too. I can't figure out why "escargot" is misspelled. At first I thought it was deliberate and that is was a clue! But come to find that Super 7 spells it that way and it's supposed to be scare-y. Long day, time for bed. I guess that's it then, waiting for time/place to drop. The Numbers poster arriving today (#281) - Better! A New Clue - Best! I called the San Francisco Super 7 store and the guy says he doesn't know anything about it. He said someone else called today and asked the same thing. For what it's worth, the guy sounded pretty genuine. I could be wrong, but we may still get one more clue before the reveal, either solidifying the place ( for people who haven't been as good at solving the puzzle as we are), or the location (either SF, Florida, or both), before the big final confirmation. This could make it Thursday or Friday. I hope friday because I'll be in the air thursday morning and otherwise would need to strike a deal with someone to grab me a poster! When I talked to the guys at the Florida store today, they were non-commital, said we were on the right track with Super7 (before today's clues were released), and said that I should call back in a day to confirm. They said they'd be having a reveal, but weren't told if it would be SF or FL. He then proceeded in giving me directions to their store. My bet is tomorrow we get date/time, and it's a Thursday release. DragonMangement- have also sent request to follow if you'll allow. I am Jst_Thinking on twitter. Thanks much. Justin -- unfortunately that doesn't mean a thing. I called the Glasgow FP before their event and even told them I had gone to all of the touble of calling from the US, and they said they "knew nothing". It could even be that just the owner/manager is in on the reveal. Either way, we should be prepared for a bicostal reveal, just in case. Walkindude125 -- seems there's usually one more obvious last clue that actually states the time/place, so hope to get that tomorrow with the reveal Thurs/Fri as you said. Highest golf score for me ever..odd that one tiny little broken toe can throw you're worse than a twelve pack. Off to watch V before bed. Oh man, I hope it's not Thursday, I'm in the field for work and a long drive to and from. Here's hoping for Friday!!! I saw the panel at Comic-Con and the new Prisoner looks awesome. They're definitely taking it in a different direction than the original, which I like. (I loved it, but better to leave well enough alone.) Too bad it's just a miniseries. Does anyone else have a sudden urge to watch the original Prisoner? Is this some sort of AMC marketing ploy? WalkinDude, I'll wave at you from my little round window at 30M if you wave back. I'm dead-poster-girl walking if reveal is Thursday. final check before lights out. I was wondering how many of you folk are from Australia, and whether or not there's any chance one of the URL reveals will be held here. After all, 'Australia is the key'. lulu, welcome to the lostARGs team. Yes, we do have some Aussie and a Kiwi amongst us. DCaaPB have gone to Buenos Aires and Scotland, so why not the land down under! although I did see "Penny" actress was in Melbourne. American product. OZ has crap internet speed. Ergo: Better get buddy in the US. "...That's it for now but look for my Lost print to drop sometime soon on Damon Carlton and a Polar Bear ..."
Slow internet in OZ? ?...what, only 7Mbps??... I wouldnt think so. NZ yes, but not Oz. I could be able to do a SF reveal as well. just depends on when it is. But believe me...if it's anywhere in the Bay Area, I'm going to try my darndest to get there! MEL, looking forward to the new Prisoner as well. The original was a bit before my time but I caught some episodes on PBS many years ago. Clearly an influence on LOST. It was the case (not sure if it still is) that you could watch the entire original series of the Prisoner on the AMC website for free. I also wanted to add that my gut tells me we are not off base in ascribing numeric values to the words in the clue. After all, the first clue was a number. V Pilot, 36 seconds in. Great find Middayshadows! I wish he gave some idea of the topic to expect. @ DragonManagement: I also sent a request to follow you. Thanks. Thanks Dragon- will unbug you later if you wish on twitter. Midday- if you look on Todd Slater's list of posters in his 2009 subscription, the third tube contains "Official ABC Lost Print". Looks like a treat for those that subscribed! longtime lurker, now starting to worry if I'll ever get one..so I reluctantly signed up for twitter (infinitepest) in the hopes that you might let me follow. That's nice, did you bring me a rotor, Zort? No rotors up for grabs, but I might get a signed ZX Spectrum in the raffle. Any thoughts on a good frame color for Rousseau's Transmission? Rob, I don't have it myself, but looking at the pictures I would say a light wood frame would be good. I used a black frame and a (brownish) gray matte which matches one of the colors. Zort70 mentioned before but clue as 12 letters. Lottery Ticket, I'm being dim, but I'm not sure what you mean. Zort, any clue on when you'll have you back turned long enough for a clue :) ? Hi Amy, I'll try and go out around 10pm (GMT) and see if we get a new clue. LT, I think I see what you mean Ghostfighter has 12 letters so the 11/6 thing doesn't make sense. Well that's interesting, and a very nice view as well! googled and walked around 720 Super7 FL. Image taken with previous tenets. Grab a slice of pizza while you wait. @Lottery - Did you happen to see a Starbucks or some place nearby that might have wifi? I'll be there tweeting the event, but would really like a shot at the poster as well. With lack of a poster buddy at this point, free public wifi might be the only option. Thoughts?? Thanks Lottery - Kahwa DOES offer free wifi. GAME ON. It seems to me that they should have ordering available on-site at these reveals, prior to the prints going on sale on the web, to allow those willing to travel and track this stuff down the guaranteed opportunity to purchase, no? For the time and effort that members of this board put in (and I know I've just recently started contributing - not necessarily talking about me), it seems to be a pretty big dis-service. There is a Starbucks 2 blocks over from Super7 - their wifi isn't free though is it? If I ever want an international spy network I'll know where to go. Well I know where to come if I need to find something out! You guys are a great investigative team! Did you see this, Zort? If we do the LOST reveal at our store, we will open up our WIFI for our guests. However, If I had to venture a guess as to what the odds are that we will have the reveal in our store, I would say 50/50. Sorry, yes I saw SF in the comments before but if they are trying to throw us off the scent then this seems a little odd ? I think that means that it may be a dual reveal - St. Pete and San Fran. Will Scott tell us that the other store will have a reveal later just to get his own back ? hey friends, why exactly are we choosing FL over SF? Based on what I've found, the SF store is the original and the FL store only opened in September. In addition, as we've seen in previous reveals, Tyson has a tendency to prefer CA over other areas of the world. I'm going to attempt to set up a twitter account for myself, just in case it is a dual or SF exclusive reveal. Also...@ReverendMilo - any progress on those rings. Haven't heard anything for a couple of days. Jeremy, I thnk there have been a couple of potential pointers on the FL Super 7 blog that make us think that. Plus, I would guess the point of S7's participation is most likely to promote its new location. Every time someone writes it as S7, I keep thinking you're talking about Season 7, aka the Zombie season. I wonder if the Escaregot, Ghostfighter, and Milton will somehow be linked to the URL. Maybe all three are an anagram of the URL to come? Perhaps I'm reading too much into this. Ooh, Todd Slater! That's exciting to look forward to! I remain, however, completely stressed out until the reveal. Lunch time... also speculation time... has anyone brought up that the CA location has different store hours than Florida? Just a further update regarding the "other" board... we moved AGAIN to a more user friendly board. It's like DarkUFO, but without the crazy moderation there. Email me if you need the address. We plan on creating a chat room there that will hopefully keep the mib people out. Jesse t, do you mean the DCAAPB URL's? I'm sure they'll be posted here. Ah, OK. I don't have time to translate it all, so I'm missing out on all the cryptic stuff. @Amy Lynn - could you email me so that I can email you requesting information about the "other" board, and I can also tell you about "PUI"
Hello all- since I posted it in the middle of the night, some might not have seen my earlier post (1:44am ) regarding Todd Slater. It *might* be the first 'official' confirmation by an artist before his poster is revealed. And of interest in that, it is not simply a rumour, for once. Out of consideration I did not want to re-post it - just thought I'd direct your attention to it, in case. Midday, methinks he's going to get in plenty of trouble for it. Thanks thorsten. I just don't have time to go back and forth with the translator, sadly. Midday, I was more referring to the fact that his fans will now be more eager to get in on the Arg. But we've had this argument many, many times! Midday, I think Tyson is quite concerned about any "leaks" of information. I don't think knowing one of the artists in advance is harmful at all, but you never know what is planned. I just caught on to this ARG, but it seems like it's going to be nearly impossible to get a poster with the way the last ones sold out :( I want to commend all of you for your work on this site though. I tried to do a little digging, but couldn't find anything too useful. @Amy Lynn, may I know how to get to other board, even if I am a more quiet member? I am lostsailors at gmail dot com. Dragon - I sent a twitter request - same name as here. @HenryGale - when i put "QNWUCAVBTLJSSVZIYIIGSGI" in the translator, at first i got more gobblety gook. and then it finally worked. is there a system? do you have to retranslate it several times or do you have to set the 3 wheels to certain letters to have it work correctly? 'Dear Ronie Midfew' post a few posts back. I'd love to see it and maybe a photo of the book too? Thanks! I'm hoping for St. Pete tomorrow. My wife has a meeting their in the evening and we could make a day trip of it. Downside is that there is a Shepard Fairey random release tomorrow and buying by phone can be iffy. Also, i wish DCAAPB would archive some previous posts to make the load times better. andalone - I'm sorry - I thought I had posted already. I will look for the information when I get home. Glad that you found a new forum/chat room that suits your needs. However I don't think it's fair to the SpoilerTV folks to call them or their behavior "crazy." I understand you're upset, but I'd suggest not painting the wrong picture about DarkUFO/SpoilerTV, as they are both good sites, and from my experiences over the past several years (not just since September) most of the mods, blog posters, irc people, members, etc. are all really cool ppl. @Congested, fair enough. However, a bunch of us were treated very obnoxiously yesterday by Pete and DarkUFO, so we left. We now have our own private board and private chat room. So everything's cool. I'm glad it all worked out for you. @TomRex - Thanks! They are the only entries missing from the scrapbook I am keeping on this. @comixguru, sorry for not getting back to you sooner, had to do work (imagine that!) but it looks like thorsten helped you out. I think I'm all caught up on sending invites to the private board. If you still need one, let me know, as the chats will be there. Can someone tweet me the cypher code @LOSTFanArt? @Amy Lynn - ditto on the chat link? @LOSTFanArt? Dusty, email me please. I don't want the link up on twitter.